Coke is it -- in Brooklyn. The Barclays Center and Coca-Cola have cut a multimillion-dollar deal to make the soda giant the exclusive soft-drink provider at the Nets' new NBA arena when it opens in September 2012, The Post has learned. Barclays Center CEO Brett Yormark said the arena and the Nets chose Coke because of its longstanding historical ties to Brooklyn, where it once was the official soda of the Dodgers at Ebbets Field. Nets fans and Brooklynites lobbied for Coke products after arena officials in 2007 initially selected little-known Jones Soda. The arena has settled its contract with Jones. "Our goal is making this arena all about Brooklyn -- even the food and drink -- and one thing that became clear to me is Brooklyn's a Coke town," Yormark said. 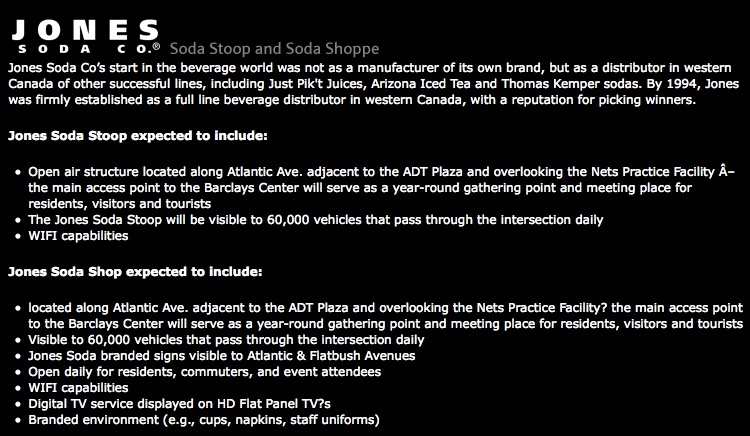 Hm, don't you think the arena and Nets chose Coke for the old-fashioned reason that it offered the most money? Would you believe that, in the official press release (below), the Nets/Barclays proclaimed, "Barclays Center Brings Coca-Cola Back to Brooklyn?" Jones vs. Coke: "thinking outside the box"
Sealing the deal is what it's all about. "The chase is what gets me up every morning," he says. The chase is also about thinking outside the box whenever possible. When seeking out a beverage sponsor for the Barclays Center, Yormark didn't call Coca-Cola. He called Jones Soda, a little-known Seattle brand. Jones got a big-time entrée into the East Coast market. And the Barclays Center got a company willing to help build its fledgling brand. Jones has already created a customized soda label with the Barclays Center logo. It's another example of Atlantic Yards down the memory hole. In 2008, Jones Soda was in financial trouble, and wanted to pull out of the Brooklyn deal, in part because the new destination was in question. Presumably now Jones might like the destination, but Jones is still in trouble. The Seattle soda-pop marketer warns in securities filings there are doubts about its ability to continue as a going concern, although CFO Michael O'Brien said it has enough cash to operate for a year and that sales projections have not continued to be revised downward. Jones has considered three buyout offers since December, when Big Red Holdings of Texas made a $7.9 million "indication of interest."